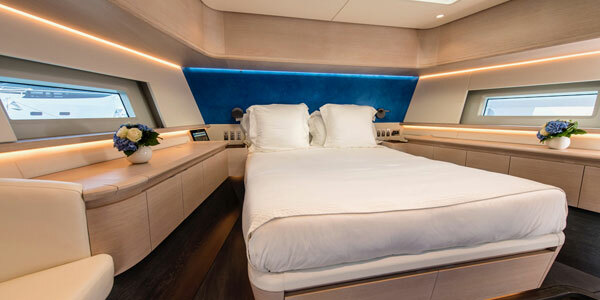 This is a new concept in motor yacht design, produced for a client making the transition from sail to power who had previously owned a 72ft yacht and sailed around the world in her. 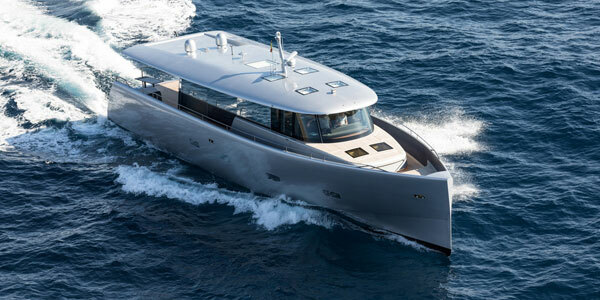 His brief to Frers – Milan was for a motorboat that would be as seaworthy, feel as safe, and be as quiet as a sailing boat. It also had to be fuel-efficient at slow and high speed, and have a comfortable motion, even when conditions get rough. 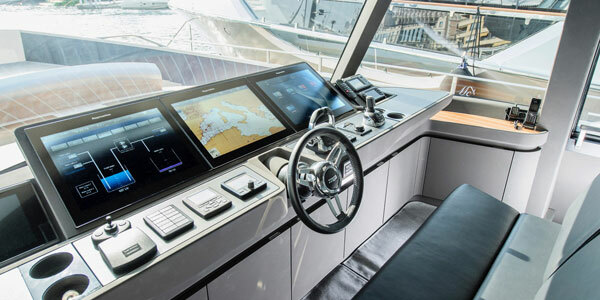 The design had to incorporate a large pilothouse and spacious saloon connected to a generous aft deck, and accommodate his family, two crew and carry a 4.5m tender in a stern garage. Other considerations included easy access to the water, a child-friendly environment, and be simple to maintain and service. 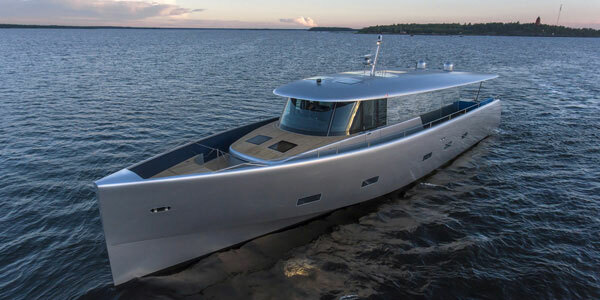 The usual solution to fuel efficiency across a wide speed range is to draw a boat with a high length to beam ratio, but narrow hulls tend to roll badly. 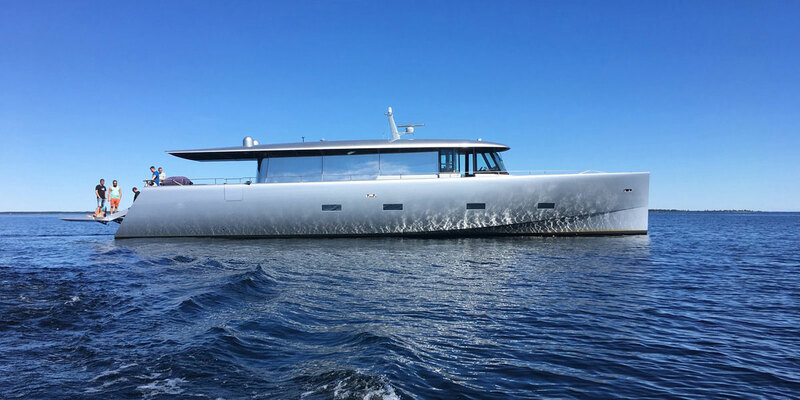 The breakthrough with the Frers 78 is that she has the width and volume of a modern motor yacht but with an underbody shape and powertrain that promote good sea-keeping qualities, is extremely fuel-efficient at 5 and 25 knots – and most importantly – is very quiet! 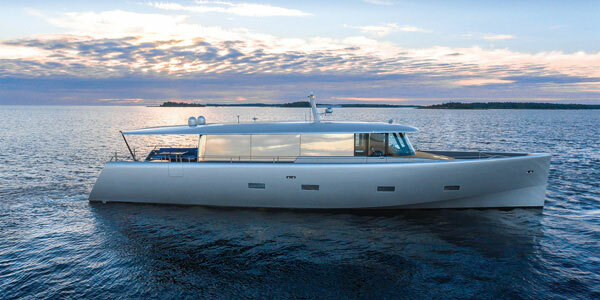 “The unique aspect of this design is the strong crossover it has between sail and powerboats” Says Mani Frers. 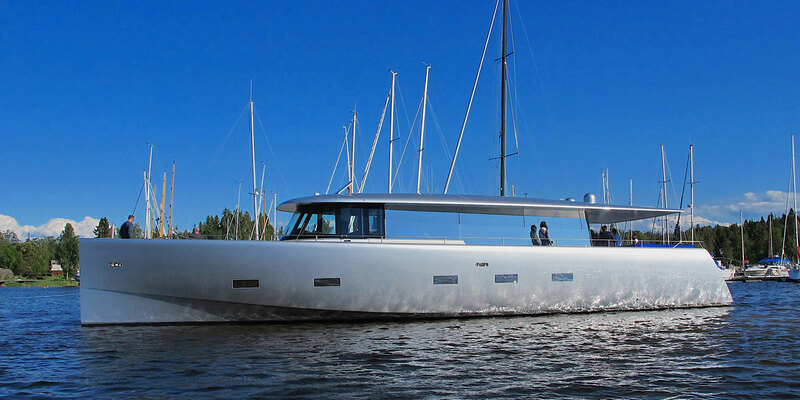 The shape of this design is in fact more akin to a fast sailing yacht than the usual deep-V or displacement motor yacht. 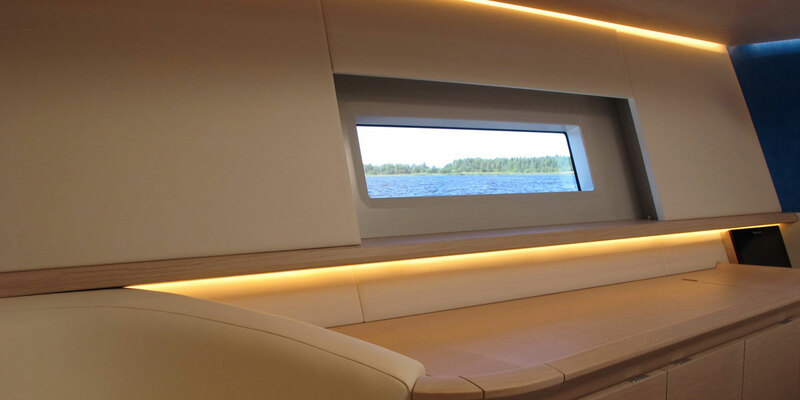 Like a yacht, the trim on this Baltic 78 does not change as speed increases. 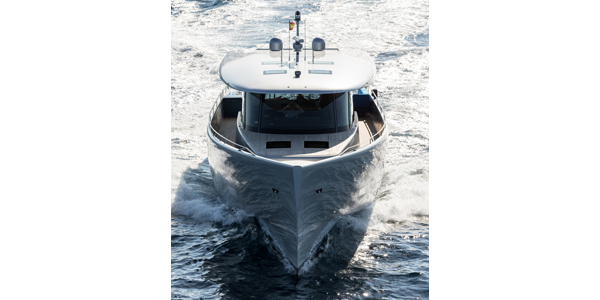 Hump speed – the point on a curve at which a hull jumps from displacement to semi-displacement or planing mode, is very smooth. This new hull form was first proven in the test tank using a radio-controlled model in waves that simulated severe storm conditions. The behaviour had been enhanced further by the fitting of Seakeeper stabilisers and twin Volvo IPS rotating drives with their forward facing (pulling) contra-rotating props and exhaust system that carries the sound away underwater with the wash. A third element that enhances fuel savings, handling and ride is the Volvo Interceptor system, a great advance on traditional trim tabs which automatically compensate for wind and load to ensure that the boat remains at a favourable running angle to maximise passenger comfort. Another design consideration as far as noise reduction is concerned, is the shape of the coachroof. “The interior is ventilated out through the top of the superstructure to reduce noise levels, but the aerodynamic shape of the roof is not only pleasing to the eye, it is designed to that the airflow carries the noise away. Indeed, the faster you go, the more the air – and noise – is sucked away from the boat.” He says. 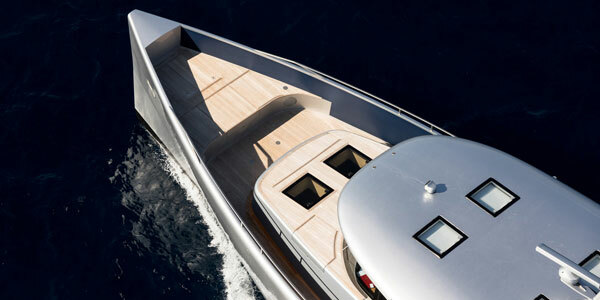 For the owner, the ‘surprise’ additions to the design is the aft bathing platform which rises up and down to make it easy to access the water or tender and doubles as a passarelle when mooring stern-to, together with an additional cockpit in the bow area for sunbathing and alfresco dining.